Antarctica – Real Science at SOEST! HAS MOVED! In March of 2012, I had the opportunity to take part in Antarctic research for the second time in my life. As a graduate student at the University of Hawaii at Manoa, I study RNA viruses that predominantly infect phytoplankton, with a focus on communities in the Antarctic. When I heard that some help was needed on an upcoming Antarctic research cruise, I couldn’t wait to get back down to one of the coldest, windiest, most desolate and absolutely beautiful places on earth. 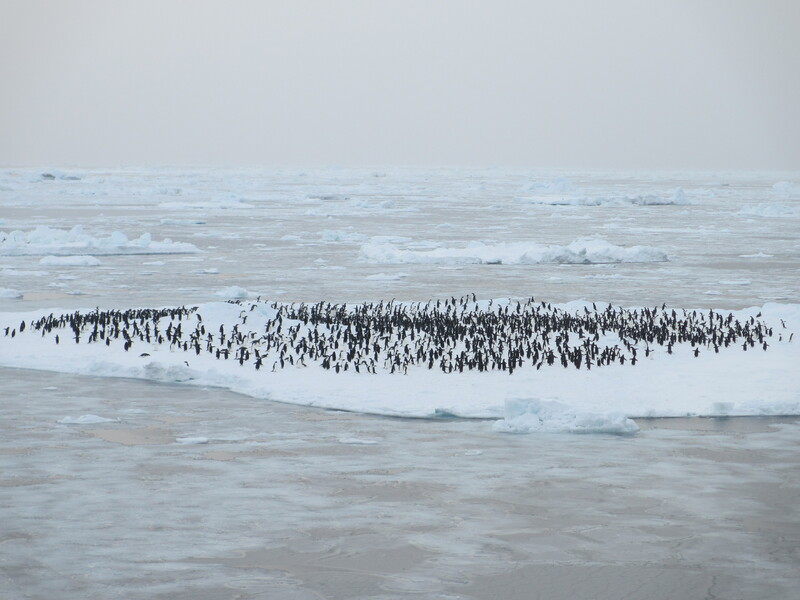 The 40-day expedition took place on the Nathaniel B. Palmer, a research vessel and icebreaker. The cruise was part of a large, multidisciplinary study called LARISSA: Larsen Ice Shelf System, Antarctica, which is a National Science Foundation initiative funded to investigate the ecosystem impacts of a catastrophic loss of ice that took place in 2002, when a 3200 sqkm piece of ice disintegrated from the Larsen B ice shelf into the Southern Ocean on the eastern side of the Antarctic Peninsula. We had a number of scientists on board, ranging from physical oceanographers, glaciologists, and geologists, to biogeochemists, marine benthic ecologists, phytoplankton specialists, microbiologists, and virologists! As we departed Punta Arenas, Chile, the Straights of Magellan were quite choppy from the high winds and stormy weather in the area. Many people were immediately ill and turning to Dramamine and saltine crackers for comfort. 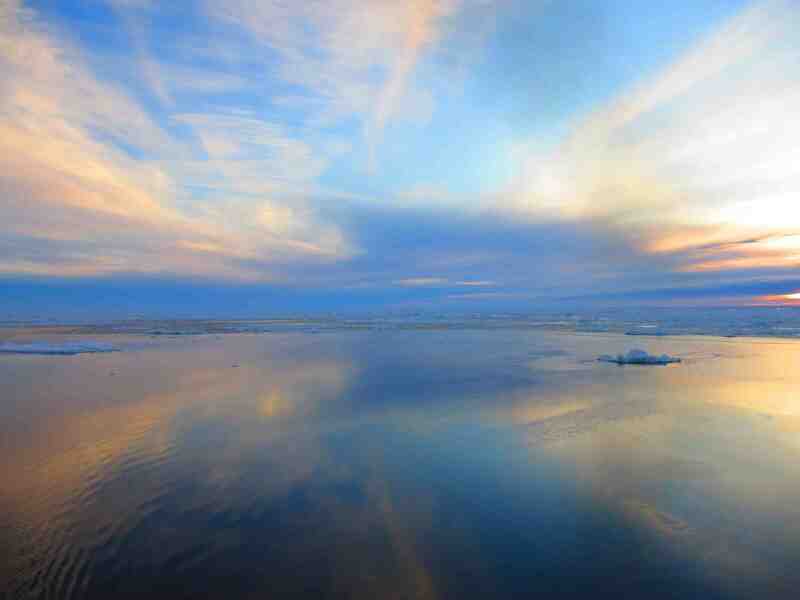 Surprisingly, as we exited the straights and made our way into the Drake Passage, the seas became incredibly calm. The Drake Passage is the stretch of water where the Pacific Ocean and Atlantic Ocean come together and the Antarctic Circumpolar Current rips through the narrow passage between the southern tip of Chile and the northern tip of the Antarctic Peninsula. It’s notoriously one of the roughest crossings in the world. When the waters are abnormally calm, the passage has been referred to as the “Drake Lake,” and we were lucky enough to experience it! On our transit through the Admiralty Sound, the weather was absolutely gorgeous and the scenery utterly breathtaking. I truly cannot put into words how beautiful and unique the world is down there. 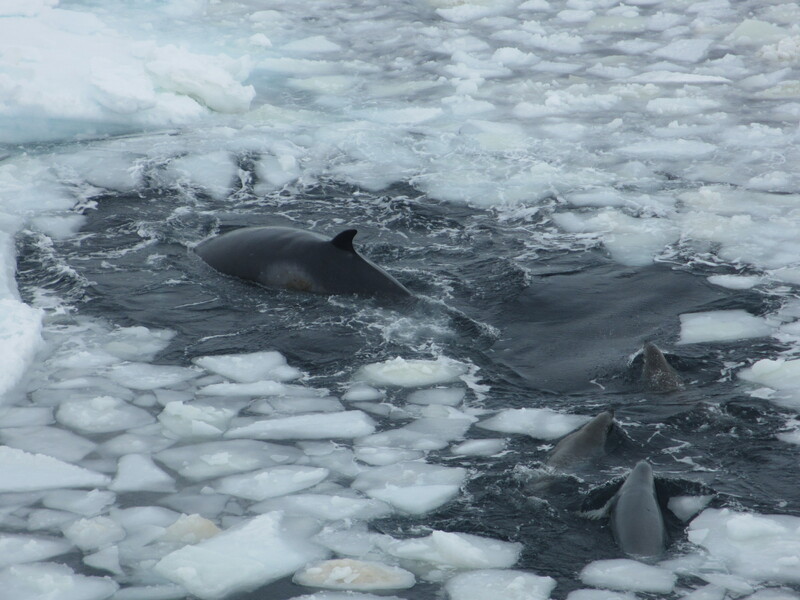 We saw numerous whales, seals, birds, and penguins with enormous ice capped mountains erected on either side of the Sound. Everyone’s spirits were high, with the sun shining and clear blue skies for miles. After the sun went down, a new beauty took over. It was impossible to capture the calm, serenity of the night with my small point and shoot camera. But imagine pitch-black darkness for miles in the distance, with the moonlight casting shadows over an endless sea of icebergs, growlers, and bergy bits. The stars were incredible. You could literally see the entire Milky Way from the top of the ice tower on the ship! At night, the captain, mates, and ice pilot used radar and spotlights to look for icebergs. It was really pretty amazing to watch. Though this vessel was built to break ice, we still had to avoid the giant icebergs and any “fast ice,” or really thick, sturdy ice. Breaking through the ice provided a very different experience for me, as far as cruising conditions go. 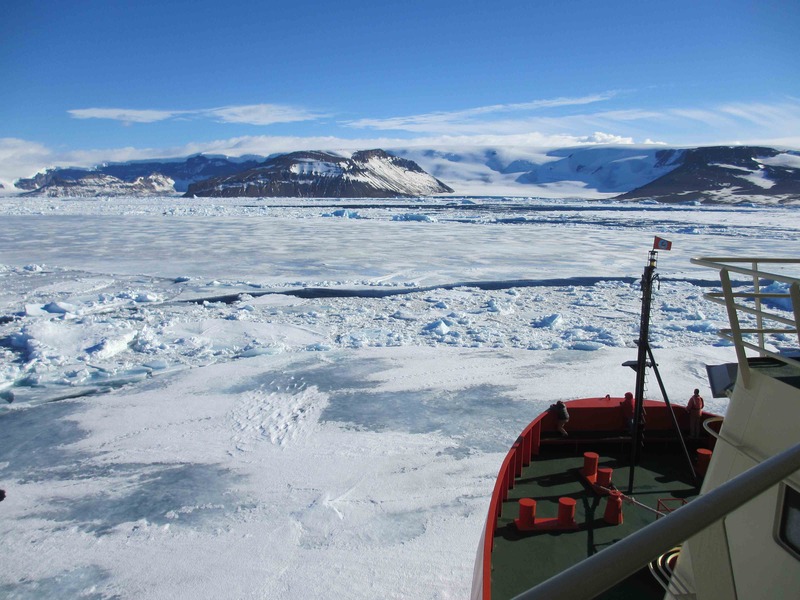 Usually I get used to the constant rocking of the vessel with the rolling motion of the ocean, but in the ice, conditions are often very stable whilst on station. However, when we were moving through the ice, crushing along growlers, and pushing aside ice floes, it often sounded and felt much like an earthquake. The ship would often get stuck up on an ice floe and tilt sideways, slowly and dramatically, and then crash back down to position as it collided into another one. Working at sea requires us to tie everything down, as we often run into rough seas and everything slides across decks and floors, off of counters and tables, or tips over and onto the floor. While on station, we tend to forget these things; so once we start moving again, everything goes flying! On the cruise, I assisted with sampling for the Smith Lab, a Benthic Ecology lab at UH that studies organisms that live within and on the seafloor. I worked the night shift from midnight to noon. Scientists usually break up the work on oceanographic cruises into two 12-hours shifts to allow for constant operations around the clock. When it costs over $100,000 a day to operate a research vessel of this size, we can’t afford any breaks! Since I was working as an assistant to one group as well as collecting samples for myself, I had my work cut out for me. If my samples came up at noon, I had to process them fully before I could get to bed, and was still expected to be back and ready for action at midnight! It’s a good thing that ship had a fancy coffee maker and an in-house barista, ready to make me mocha lattes every morning! 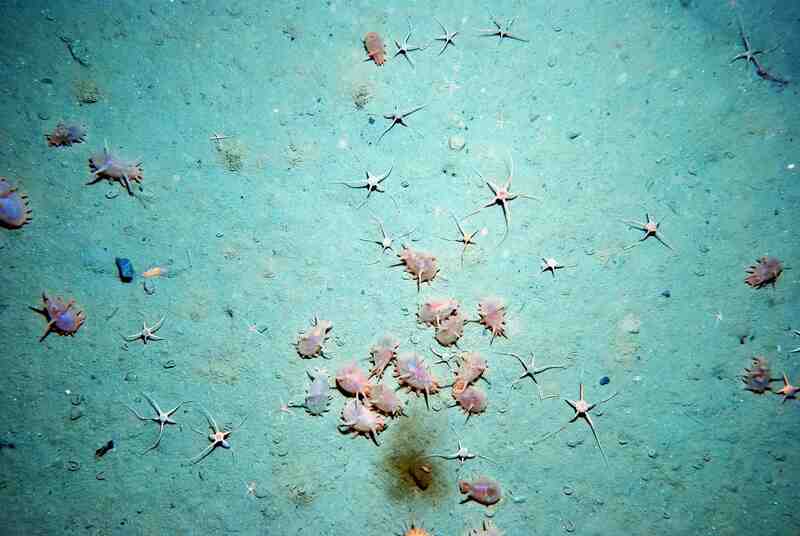 The benthic (seafloor) sampling began with a camera survey of the seabed to determine whether or not the sediment was soft enough for Megacore sampling. The Megacore is a piece of equipment with 12 plastic cylinders that penetrates the seafloor to collect cores of sediment ~20-40 cm deep. 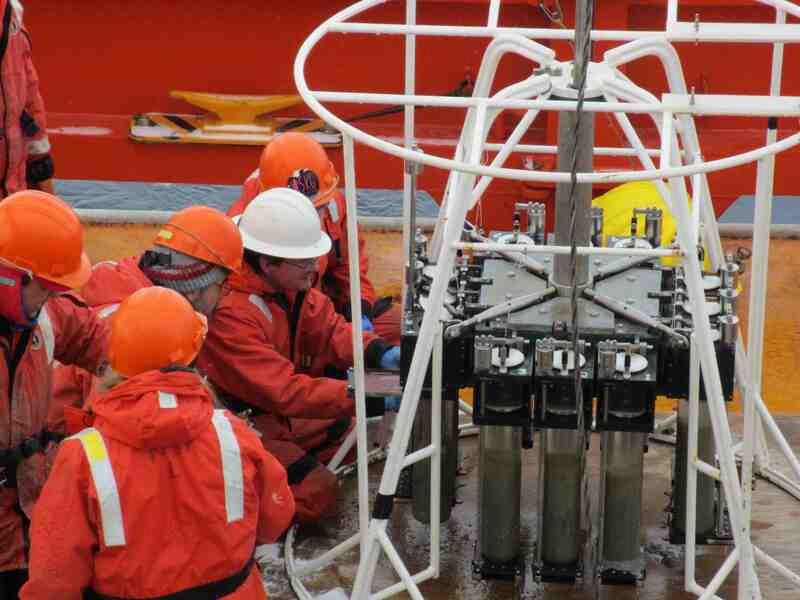 When the equipment came back on deck, below freezing temperatures made it very difficult for scientists to retrieve the cores as they were often frozen in place. We then sectioned the sediments by pushing the core up through the plastic cylinder with a piston extruder to slice off 1 cm sections; which were then analyzed for chemical composition, and abundance and diversity of organisms, both large and microscopic. This whole procedure took about 2 hours for deployment and retrieval of the Megacorer, and anywhere from 3-24 hours of processing of the cores. The Blake Trawl was one of the more exciting operations, though processing of the sample was very time-consuming and tiring. We basically dragged a net along the seafloor which collected a bunch of sediment and rocks, and any organisms greater than ~2 cm in it’s path. After hauling the large glob of sediments, rocks, and organisms on deck, we dumped it onto a sorting table to hose away the mud and reveal the interesting creatures! 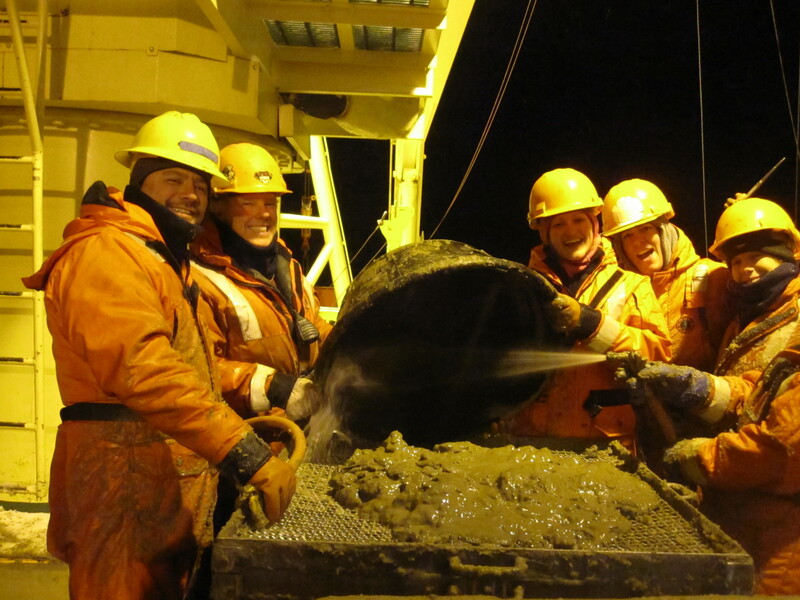 The Blake Trawl sorting photo shows scientists hosing away the sediments during one of our night shift trawls. This was the very beginning of the process where we stopped to take a photo… by the end we were covered in frozen mud and water spray from head to toe! It was so cold outside that the water literally froze to our Mustang suits (orange float coats/pants, required for on deck operations), and formed icicles along the edges of the sorting table. As we uncovered the organisms, we sorted them into buckets of filtered seawater, and saved them for identification and food web analyses. We unfortunately did not make it to all of the intended stations due to difficult ice conditions throughout the cruise. However, we were still able to collect a large number of samples from the Larsen A embayment for all of the scientists. We hope to put our samples from the water column and sediments into the context of climate change effects in this region, and determine the impact of large ice shelf losses on the ecosystems below. Continuing to monitor and explore these regions is crucial to understanding the implications of global warming in such a delicate, unique environment. 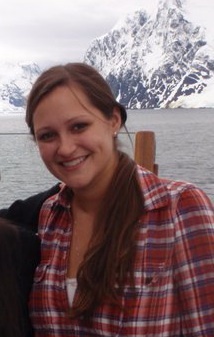 Jackie Mueller is a PhD student in the Oceanography Department studying marine RNA viral diversity and dynamics. She is using cultivation independent techniques to characterize the composition and structure of the RNA viral community along the Antarctic Peninsula.